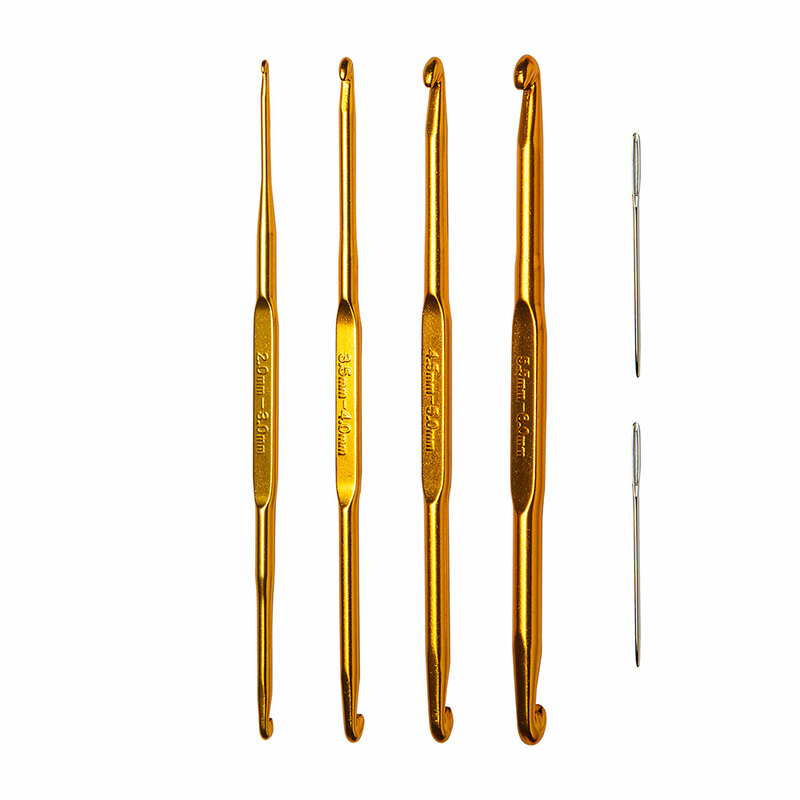 These double Aluminum ended crochet hooks are perfect for picking up stitches. The double ends give you plenty of size options to work with too. 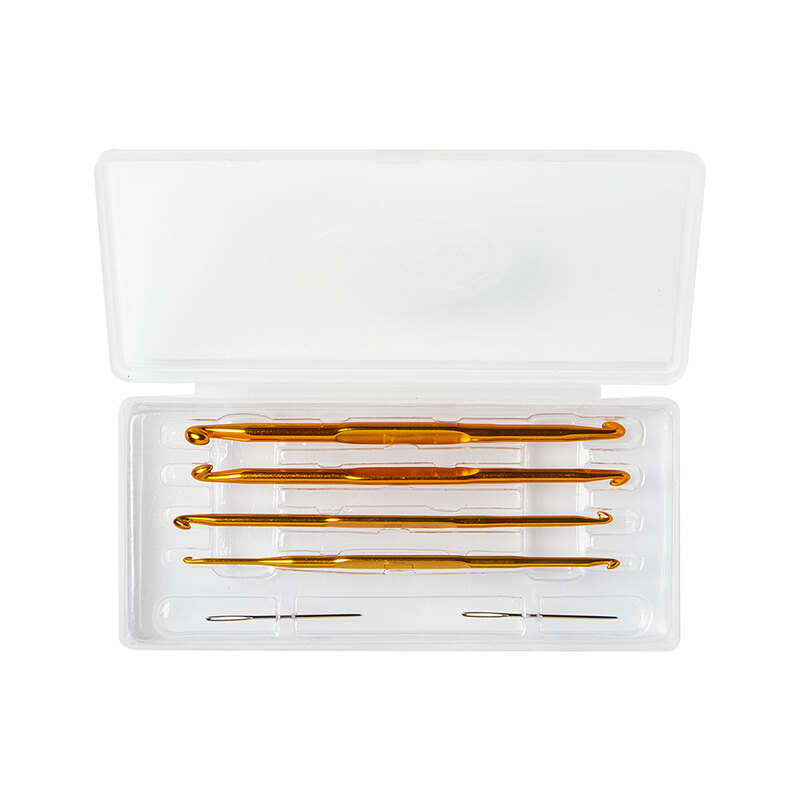 Packaged in a convenience storage kit, the set contains crochet hooks, 5 3/8" in length, with ends in size 2.0, 3.0, 3.5, 4.0, 4.5, 5.0, 5.5 and 6.0mm along with 2 blunt tip tapestry needles. I received my goodies. Right away, I put my hooks to work. I don't think I'want to use my others again. They pick up the stitch so well. For this price it's a steal. Next time I have an order, I'm going to get another set, for sure. Thanks knitpicks ?? 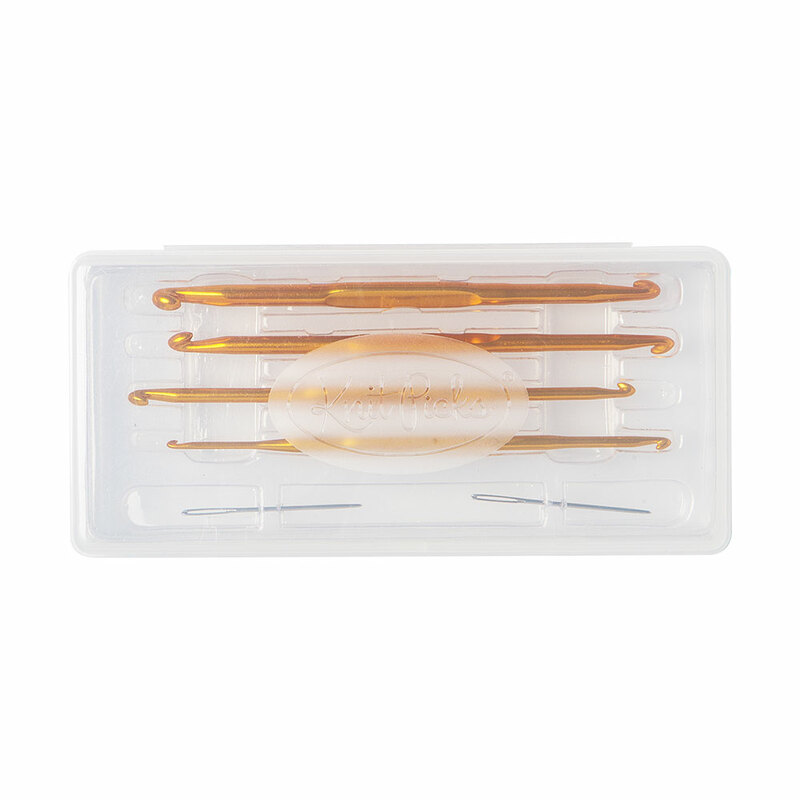 I don't have this product but I have double-ended crochet hooks and find them invaluable in doing repair when I have garter stitch repairs. You don't have to take the hook out just slide it through and change the angle and the repair is perfect and does not stretch out stitches and does not make me fray the yarn and want to pull my hair out. When I purchased this set, I thought the double-ended hooks would be much longer. I had been wanting the accommodate numerous stitches in a width of a piece in order to practice the "Crochet-Knit" or Afghan stitches where you use both ends in a process of looping on for the first row, then, turning to work stitches off with a second color. These are good heavy metal hooks, but the width only does a maximum of 28 stitches with Sport weight yarn. I'm trying to do a man's neck-scarf which will be beautiful when finished. I just received this in the mail yesterday and I was amazed at what a high quality product I received for the price point! The storage case is like a hard clamshell pencil case, whereas I was expecting something along the lines of a slim envelope. Thank you Knitpicks for exceeding my expectations yet again! I bought this set last year when I wanted a set of hooks that were easier to travel with. They are quite handy, comparable in feel, weight, and hook-end to a Boye crochet hook. The needles and hook case are a nice addition as well. I took out the plastic insert and leave everything laying loose in the case. I've since added several other Knitpicks tools!